Family Friendly Sites: Roof Top Services of Central Florida, Inc.
You are here: Home > Global and Local >North America >United States >Florida >Orlando > Roof Top Services of Central Florida, Inc. 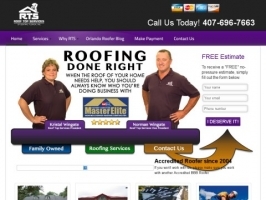 Roof Top Services has been in the roofing business for over 25 years in Central Florida. We have an A rating with the Better Business Bureau and offer Energy Star roofing products which will save you money. Our skilled roofers get the job done!